"To Trek To The End Of The Earth"
"To Shlep All The Way Across Town"
For centuries, the Cascine had been a vast agricultural estate belonging to the Medici family - extending for three-and-a-half kilometers along the Arno River. On major holidays (like the Grand Duke's birthday), the rulers of Tuscany graciously opened their property to the populace for picnics, sports, dances and other rural pastimes. In the nineteenth century, the Cascine became a public park, in the modern European style - with monumental features of the most imposing kind. 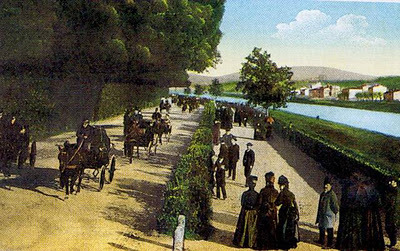 Especially during the brief period (1865-71) when Florence figured as the first capital of the united Kingdom of Italy, the Cascine emerged as a fashionable promenade and carriage drive. In 1941, the song Mattinata Fiorentina/ Morningtime in Florence was an international smash hit (within a forty mile radius of Brunelleschi's Cupola). messere Aprile fa il rubacuor! Mister April is stealing away your hearts! The Feast of the Ascension of Christ (forty days after Easter) was the Cascine's annual star turn. 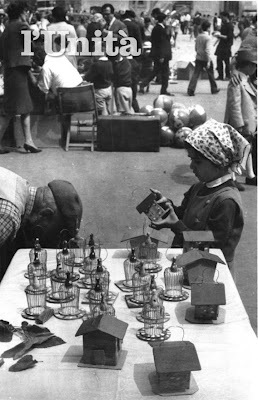 a girl considers the various cricket cages on offer. Children with their parents, grandparents, neighbors and friends flocked to the park for the caccia al grillo (cricket hunt), an ancient local observance lost in the mists of time - supporting a cottage industry of gabbiai (cricket cage makers). Carlo Collodi (the ultra-Florentine "Father of Pinocchio") ushered local Cricket Culture onto the stage of World Literature. (where it is still a common label for a "know-it-all"). Until 1999, when the city government banned this barbaric custom, ending centuries (possibly millenia) of unspeakable cruelty to crickets. And reserving the Cascine for other more worthy entertainments. a song waiting to be written. 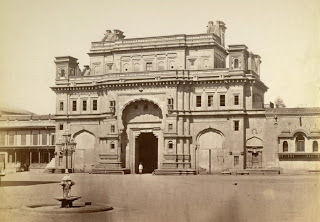 But how did the Maharajah get from India to Italy and from Kohlapoor to the Cascine? 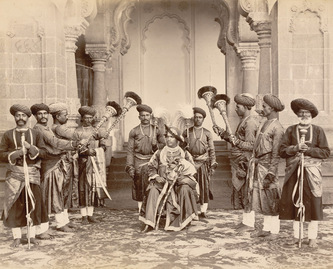 a ceremony at the court of the Maharajah. 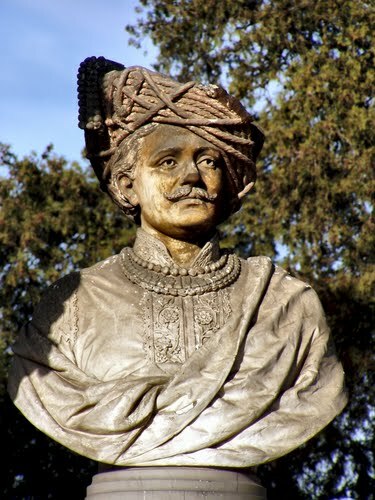 In 1866, the sixteen year-old Rajaram Chuttraputti ascended the throne of Kohlapoor - a mid-sized principality in the northern region of Maharashtra. In 1870, he traveled to England to exchange courtesies with Queen Victoria. 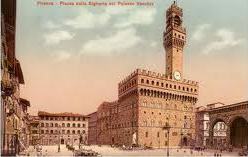 On his way home, he passed through Florence - then the capital of the new Kingdom of Italy. While staying at the Grand Hotel in Piazza Ognissanti, the twenty year-old ruler sickened and died - leaving his entourage and the Italian government with the unprecedented task of organizing a Brahminic funeral on Tuscan soil. the Indian) at the river junction. A vast pyre was needed to cremate the body and it had to be constructed at the juncture of two rivers. 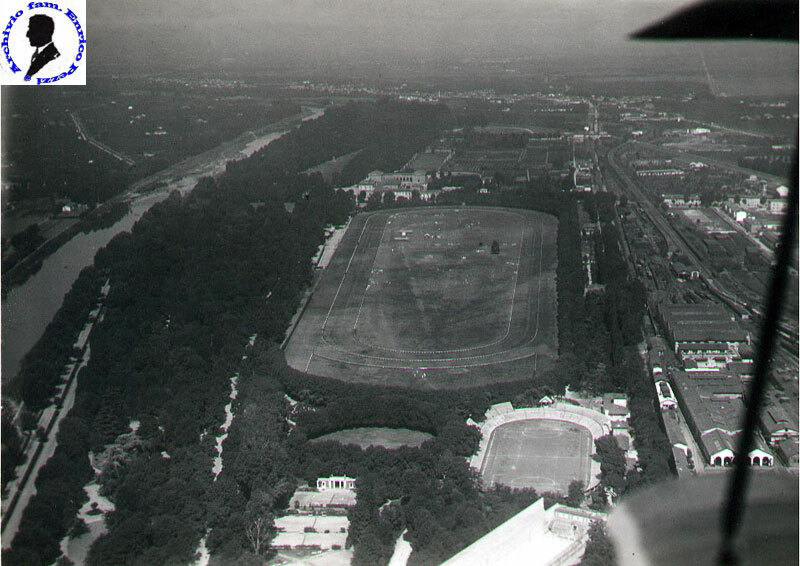 And conveniently enough, the Mugnone River branches off the Arno at the farthest reach of the Cascine Park. 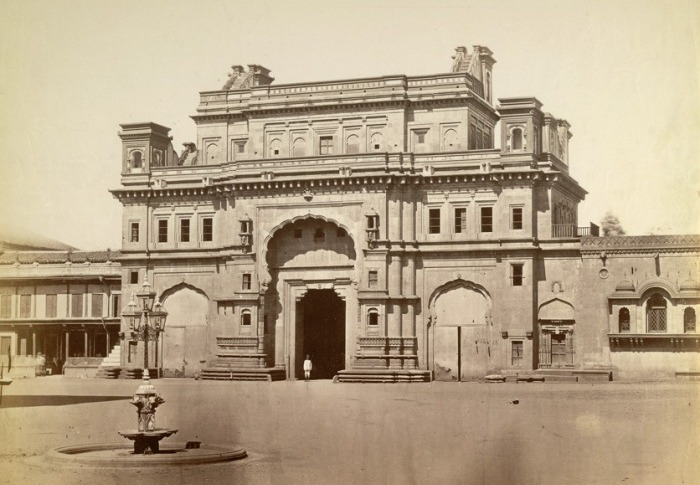 The Maharajah's funeral was a public sensation. Then after the exequies, the sculptor Charles Francis Fuller erected a memorial in high Anglo-Indian style (with full inscriptions in Italian, English, Hindi and Punjabi). (as it is locally known). Then in 1972, a highway bridge was thrown across the Arno-Mugnone junction, adding a contemporary visual note and soothing background noise. The notorious Viadotto dell'Indiano (Viaduct of the Indian) has become a local by-word for snarled traffic, frayed nerves, wasted hours and (sometimes) death. "Detour: Viaduct of the Indian Closed"
And as the years pass, more and more harried commuters assume that "the Indian" is merely a bridge - seldom suspecting that the spirit of a Maharajah lurks nearby. cell phone of a desperate motorist. Fascinating. I had never heard of the poor benighted Maharajah. The funeral must have been a spectacle to behold. This is the first I've heard of the cricket caging tradition either. I bought a t-shirt my senior year in high school that had "Happy Cricket's Day" written on it. I thought it was just random Itanglish gibberish, fodder for much teasing from my American friends once I took it to college with me. Now I'm wondering if there wasn't a whole secret cricket cultural subtext underlying the seemingly meaningless assemblage of words. Florentines are perpetually starved for touches of exoticism in their lives and the Mahajarah's funeral certainly provided that in spades - at a time when Florence was (briefly) on the world stage as the capital of the new Kingdom of Italy. I picked up a few references to debates within the Italian government regarding the funeral, which evidently required high-level approval. Florentines are intensely sensitive about the ethnic cleansing of Pinocchio - which is written in an intensely jokey Florentine style and full of local references (including the "Talking Cricket".) Walt Disney not only detuscanized Pinocchio, he evidently considered the Italian context to be overly ethnic for his market - and thus the Tyrolean costumes and the Alpine chalet. 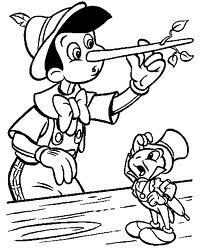 Back in 1990, when they were planning the World Cup in Italy, the organizers wanted to develop a Pinocchio mascot (along the lines of the Argentine mega-success, Mundialito) with a tricolor red, white and green nose - but Disney mobilized their lawyers and that was that! Thanks, Chai! I would be very interested to hear more about the resemblances you see between Italians and Indians. For my part, I have always been intensely aware of the cultural and social parallels between Italians and Jews (even from Eastern Europe, like my ancestors). Specifically, I would cite (1) the importance of family, (2) a matriarchal culture barely hidden behind the facade of a patriarchal one, (3) the assumption that anything you accomplish will be done by way of family, friends and other personal contacts, (4) the central importance of food, (5) the emphasis on "una bella figura", making a good show, and (6) a high level of drama in daily life. How many of those are also Indian, I wonder? !